Christopher Morley was one of the most famous American journalist, poet and essayist who always wanted to live his life at his own terms. He began his career as a writer while he was still in college and from there he slowly and slowly gained popularity in the literally world. His quotes are the representation of his life in the words. "There is only one success - to be able to spend your life in your own way"
The way he spent his life is well showcased by his quotes. He was an optimistic person and his quotes always leave a positive impression. His quotes show his disinterest in money minting process of society. He just wanted to earn the amount which was enough to life his peacefully. His quotes teach us to live life joyfully and inspire to work hard to fulfill our dreams. He was a veracious reader, he always loved to read. He wanted to learn every day something new, so his quotes always inspired us to learn something new every day. He was a fun loving person who believes in every emotions and relationship of life. He always inspired us to love and live happily. His quotes were full of humor and teach us to be enthusiastic in every phase of life. He was a brilliant poet who inspired people all his life and left many brilliant and inspirational quotes to keep inspiring people forever. 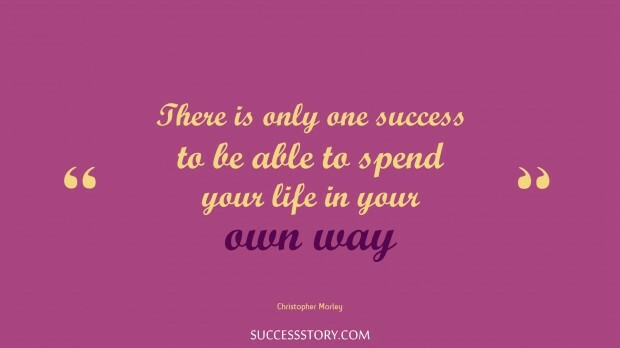 For him success was spending your life in your own terms and this is evident from his quotes. A person with truthful nature always motivates us to be truthful and true to ourselves and spend our life always happily.